Professional Placement Services will be attending the 2014 MEGA Healthcare Conference, and we wanted to invite everyone to stop by. Come stop by our booth (18,19) on Thursday, January 30th and Friday, January 31st for your chance to win free Brewers tickets. 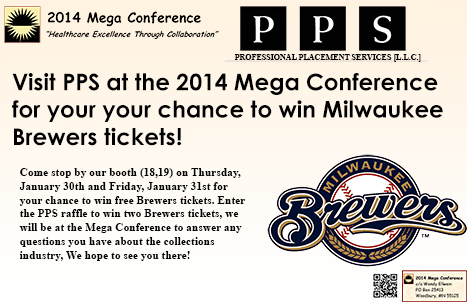 Enter the PPS raffle to win two Brewers tickets, we will be at the Mega Conference to answer any questions you have about the collections industry, We hope to see you there! The 2014 Mega Conference is a tremendous educational opportunity for Accounting, Billing, CEO, CFO, Clinic Office Managers, Coding, Collections, Compliance Officers, Customer Services, Director of Patient Accounts, Patient Accounts Managers, Finance, IT Staff, Materials Managers, Privacy Officers, Registration, and many others. It allows you to network with fellow associates, learn from industry speakers, and meet business associates from many different industries. This will be the sixth bi-annual Mega Conference. Conferences in past years have drawn roughly 500 attendees. Where: Kalahari Resort and Conference Center in Wisconsin Dells, WI.